After many years in the landscaping business in Sarasota, FL, we’ve had many questions over asked regarding what are the best irrigation systems and landscape drainage options in our area. While we’ve touched on the difference between spray and drip irrigation in another FAQ on the “Best Irrigation Systems,” we’ve yet to discuss drainage system. The first thing to keep in mind is that your landscape will not survive or maintain its well-being without proper drainage. Water will begin to build up and in turn, it will overrun your plants, flowers and the rest of your landscape—making it a muddy, damp mess. With that in mind, it's important to realize that a well-designed and built landscape that incorporates areas for draining is critical. Without one, all the time and money you have invested in your landscape and hardscape will ultimately be a waste—and our team would never want to allow that to happen. Now, Drainage issues can begin thanks to an inflow of rainwater caused by a powerful storm is not the only thing that creates drainage problems. If you installed downspout storm drains right along the foundation of your house, this can also cause problems. Downspout drains are supposed to transport water away from your house, but if they are installed too close to the building's foundation they could redirect water right next to your house. Adding to the problems is the fact that leftover storm water can take a long time to move. Water tends to flow towards lower locations, so if there is a noticeably low spot in your yard storm water will get trapped there. Without an effective way to remove this water, it will stay there until it is eventually evaporated. Then, you’ll find yourself with another problem: standing water. ​When rainwater isn’t able to move it can cause serious harm to your property in a number of ways. Large, non moving puddles of water crush the grass underneath it, and if the water stays for too long the grass could start to die. As mentioned previously, overflowing water could be directed towards your house, and this can result in either a flooded basement or the development of mold on the walls. In general, one of the best ways to combat all of these problems is to install a drainage solution in your yard. Drainage solutions are designed to transport built-up water away from your property. By moving stationary water away from your home, the drainage solution protects the things in your yard from major water damage. 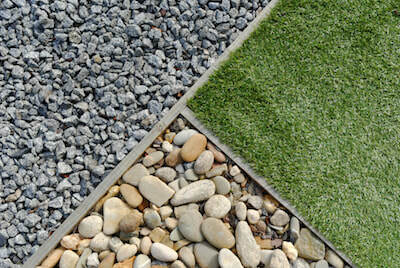 Depending on the setup of your yard, the installation of a drainage solution can take about a day or two. Typically, you should consider installing one of these solutions during the summer, since the drier soil is easier to dig up. 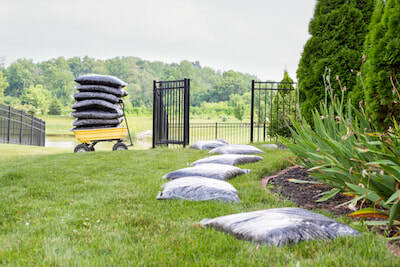 Doing this will also protect your yard from the powerful storms that occasionally occur during the summer. To find out more about what landscape drainage solutions make work for your property, feel free to set up a complimentary consultation with one of our team members.